Now you will be singing that all day! Those French knots were not for the faint of heart! They are not perfect, but I don't think I can do any better. enjoyed the sea cruise, mind you would not like to be on one as I get so sea sick. Have you tried colonial knots instead of french ones, I find them much easier to do, avoiding the french ones if at all possible. Thanks, Margaret. I haven't tried Colonial knots yet. The instructions look a little confusing, but I'm sure it is just a matter of doing it. I will keep that in mind! I have been looking at a river cruise along the Mekong next year, and thought from your header you might be posting from a stitching cruise! You are not wrong about the music. I'm glad the bite is not an iceberg! 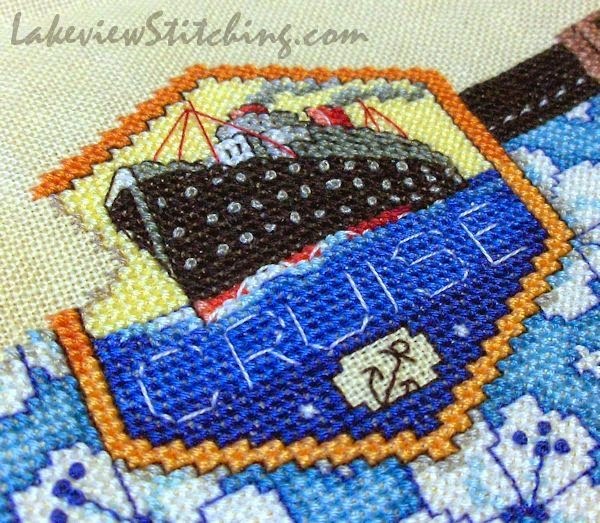 The ship looks great in stitching - for my own travel I think I'll look for something smaller! I am in serious awe of you, cleaning up projects from your "archives". Hey, but when you're stitching to a tune like "Sea Cruise", it's all a lot of fun. Enjoy! That's so fun that you set us up with some music first. I'm a big fan of your sticheries and this one is as brilliant as always! !